Cook the linguini according to the package, drain and toss with the lemon juice. Set aside. 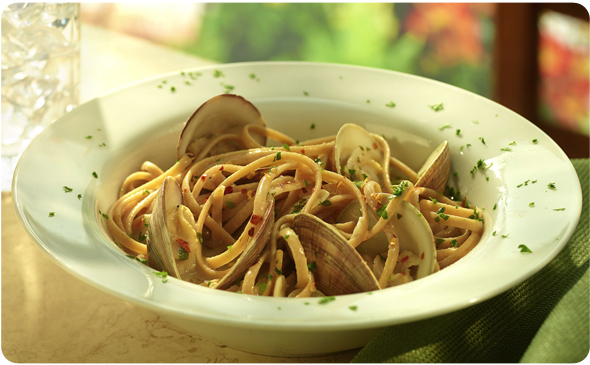 Add the clam juice, white wine, Roasted Garlic Base, Clam Base, garlic and red pepper to a large stockpot. Bring the mixture to a boil. Add the clams. Cover the pot with a lid and steam the clams until they open, about 4 - 5 minutes. Transfer the clams from the pot to a bowl, set aside. Discard any clams that did not open. Add the pasta water to the pot and bring to a boil, reduce the heat and simmer for 3 - 4 minutes. Whisk the butter and parsley into the sauce. Add the linguini and the cooked clams. Toss to combine.